The original ROM is hard to come across on the web nowadays. They started mysteriously self-destructing sometime around 2003, and the ones that are still intact seem to have a lot of data missing... Forgive me if this replica isn't exactly how you remember it, I don't have a good reference for most of this. Reset Radd's "on ground" property between levels so if you're jumping at fadeout you don't immediately get stuck "landing" when the next level loads. Made health persistent across levels and saving. Made next powerup spawn persistent across saving. Re-enabled Radd's wider variety of intermission screen facial expressions and added a new one. Radd will have a happy face at the next stage's title card if you cleared the stage without taking damage. Radd will have a serious/angry face when respawning for his last life. 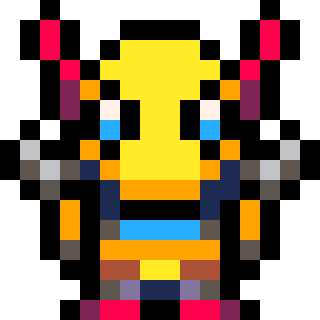 New: Radd will have a surprised/scared face when clearing a stage on your last life with only 1 hit point left. Removed the "Sharp Painful Object Land" stage title, it turns out that was just a punchline made up for the webcomic. Added proper damage and death states for the player and enemies. Compacted SFX into quarter sfx units, and added a few new ones. New sfx player function, to manage sound channels and priorities effectively for minimal impact on the music. Added "powerups" to heal Radd. Renamed most of the stages. Simplified tile collision handling for most entities. Split the source code into those newfangled tab-pages. Added CPU counter to sprite viewer. Lowered music volume further to not compete with sfx. New Yellow Brick Road end screen. More (empty) level slots explorable. Fixed up map and collision systems to accommodate maps larger than 1024 pixels wide with wraparound. Added simplified stage clear sequence. Re-added background scenery objects to Radical Boardwalk. Added a new kind of platform collision for underground. Finally got the map tiles up again, and now they actually have proper collision! Added another string parser for entity animation data. Added Radd, Bogey, and jumping physics. The engine rewrite finally paid off. Clear title screen graphics out of shared sprite memory and put active map tile data there in-game. I'm in the middle of an engine rewrite to simplify things and compact the data and stuff. Added more sprites and sound effects. Removed Bogey landing sound effect. There's not enough space for it at the moment! Moved Sound Test to a new debug stuff menu if you press "right" at the title screen. Added a Sprite Test to go with the Sound Test. Game is no longer in an even slightly playable state, again. u_u; But it will come out better than before, surely! Added a sound test, including the currently unused tracks that are completed in the game. Fixed the exceedingly minor death animation bug. New map segment system implemented, getting the level geometry back again and highly optimized in memory. New entity --> tile collision code partially implemented (but not even close to fully functional yet). Try watching the first enemy in the game for a while. Added per sub-sprite flipping and palette remapping, for advanced effects and optimizations. Added pain / death / game over for the player. Expanded jumping mechanics to allow better freedom of movement and a tiny delay before jumping. Lowered walking speed to make the air movement speed difference feel less conspicuous. Temporarily removed complex map geometry. Added title screen, title music, and screen fades. Changed background rendering to a dynamic looping scene, in preparation for map crushing. Changed sky color to light grey. Yeah, I'm interested to see where this goes. 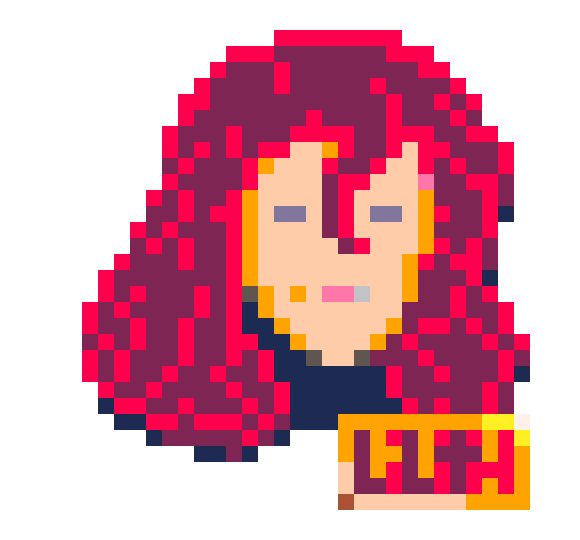 I'm getting distracted and making a lot of other little things on the side, but if I could bring Kid Radd to the Pico-8, it would truly be my magnum opus. 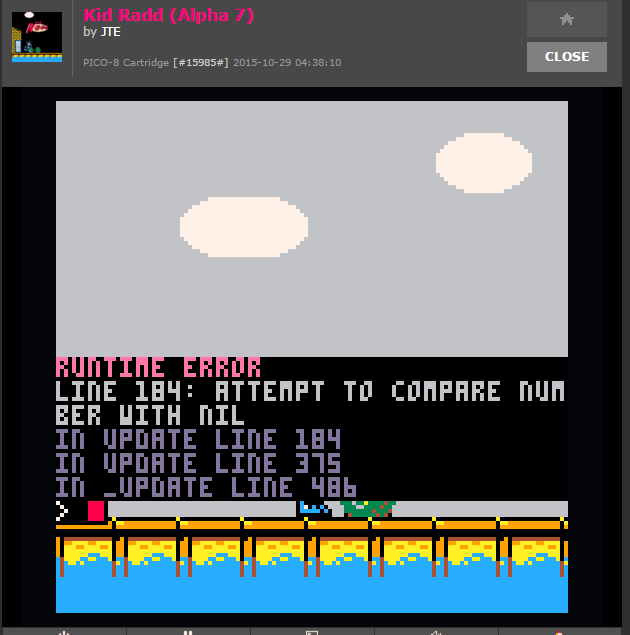 Kid Radd was almost definitely a real game for a real console in the real world and not at all a collective fever dream we had 10 years ago of which remains little to no proof that it ever even existed in the first place. I'm almost 27% certain! The dream isn't dead, but it's actually really ambitious to try and cram all of this in here without cutting corners... Kid Radd is just full of so many giant sprites and animations and music... The music..! I barely even have enough sfx slots left over for the basics. Will have to look into compressing and swapping the soundtrack out like sprite banks so that more general sfx can have the legroom they need. And the gameplay itself is only fractionally there, with no object to object collisions still... Still so much to do! When I run out of code space it'll all be over, I probably won't even have enough room to implement the final boss even if it's the only boss in the game. Too bad about the space limitations. Have you considered using multiple carts? The original game made good use of bank switching if I remember correctly. I would, but then it wouldn't work on the BBS. It seems like that would be better to use that for development purposes, eg. load uncompressed sprite banks from other carts to begin with but compress everything and replace the loader with decompression later. Is this related tot he NES game Totally Rad? I loved that game when I was younger. I remember being in Toys R Us and pleading with my parents to get it for me (which they did not, I got it months later from a relative as a christmas present). Fun game, hard though, never made it past level 3 or 4. Anyway, sorry for the potentially off topic comment. Your game looks great! Good music too! Good eye! It's sort of an alternate-universe mix-spoof of both Totally Rad and Kid Kool (hence the title.) It turns out this is a lot more apparent with Pico-8's limited palette making it appear similar to nes colors rather than the səu originals. If you'd like to know more, you can read about it on a backup mirror webpage here. Updated to "Alpha 18" today. I am pleased to announce that the game is finally in a "playable" state, although it's not particularly "good". I believe this is the last version I'll call "alpha", because the next thing to do is implement ninjas and maybe the apple projectile, then it's ready for "beta", where I start working on detailed level layouts. buuut I'm already at 95% compressed code capacity, so I'm gonna have to start compacting, simplifying, and stripping things out just to make more space soon. Edit: aaand then I release a giant bugfixes patch the same day. heh.